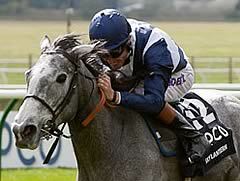 Sky Lantern won a thrilling renewal of the Qipco 1000 Guineas at Newmarket for the Richard Hannon team. The grey, sent off at 9-1 after being well beaten by Hot Snap in the Nell Gwyn, came to challenge down the outside in the final furlong as Just The Judge was slowly getting the better of Winning Express. Richard Hughes, who had such a disappointment with the defeat of Toronado in the 2000 Guineas on Saturday, edged into the lead close home to grab the Classic prize by half a length, with Just The Judge second and Moth running on well for third. Emotional champion jockey Hughes, who was claiming his first domestic Classic triumph, said: "It's taken a long time (to win a British Classic). They didn't go over fast - it was all about giving her plenty of cover. She was tough to see it out to the line. "My wife was so upset (after Toronado's defeat) - I was consoling her all night - but today was great. I believed in this filly. I knew I gave her a bad ride the last day, but she's a good filly and loves that fast ground. It's thoroughly deserved." Richard Hannon jnr, the Herridge handler's son and assistant, said: "We were pretty low after Saturday. It was a very disappointing, but she deserved a bit of luck, this filly. "She went to America (for the Breeders' Cup) and didn't get any luck, and then she bumped into a very good filly (Hot Snap), who didn't run her race today. "I'm delighted for Hughesie. He's one of the best jockeys ever and I'm just delighted he's done it on one of ours."